Thanks to popular impressions spread worldwide, visitors to Dallas are always surprised at the lack of cactus in the area. Aside from particularly lucky and rare clumps of prickly pear (Opuntia spp.) in areas with exceptional drainage, this isn’t a particularly friendly area for succulents other than parslane and moss roses. If you see a stand of cactus in someone’s front yard in the Dallas area, that’s because the owners spent an inordinate amount of time and effort in setting up the right bed with the right amount of drainage. This is a little less necessary in Fort Worth, but you’re still looking at local soils that are far too clayey and local rainfalls a little too high for them to grow just anywhere. If you want to see cactus in the wild in Texas, you’ll have to go west. Well west of Fort Worth, at least. You can also head south toward Austin and San Antonio, but the really interesting cactus kin the state are found in Big Bend National Park. Don’t forget other parts of the state, because you may be delightfully surprised by what’s out there, when, and why. For instance, my parents-in-law own a ranch in West Texas, fairly close to the town of Mineral Wells. As the picture below demonstrates, it’s rather scrubby chaparall. The area gets a surprising amount of rain through the year, as most of the big storms that hit Dallas and Fort Worth start in this general area, but the limestone beds that make up half of the local strata are sufficiently fractured that water just drains through. The sandstone that makes up the other half is extremely porous, so between the two, rainfall runs straight down to the Brazos River. Enough, just enough, is trapped in local clay pans that many trees and other plants can survive the brutal summers. It’s just enough to support mesquite, Western cedar, and scrub grasses. The grasses in question can get fairly high, and as such do a very good job of concealing one of the easternmost species of barrel cactus in the US. In fact, sometimes that grass does too good a job. This is Echinocactus texensis, native range from West Texas into eastern Arizona and well south into Chihuahua, Mexico, which goes by common names such as “pincushion cactus” and “Devil’s footstool”. Its most common name, though, is “horsecrippler,” for two reasons. The first is because of this cactus’s tendency to grow best in flat, clayey plains that produce prime horse forage. The other involves those spines. If you take a closer look, you’ll notice that each rosette, or areola, of spines consists of six small spines and one large downward-pointing spine. In lush times, the cactus’s flesh is full of water, and the big defensive spines point downward to protect it from being rooted up by cattle or pigs. When things start drying out in the summer, though, the cactus’s body starts to collapse like a deflating soccer ball. When it does, those big spines gradually point upward. Speaking from personal experience, they’re sharp and strong enough to punch through the sole of a standard-issue Army boot and through a motorcycle tire, and they can very easily leave an inattentive horse temporarily or permanently lame. I’ll get to the fruit in a minute, but they illustrate why these can be a danger to people and pets at times. These fruit generally ripen around the end of May, and that’s about the only way the cactus can be spotted easily in the wild. The rest of the year, they grow as far down in the soil as they can, and in high enough grass, they’re nearly impossible to see until you’re right on top of them. The other time E. texensis is easily spotted is when it blooms in early spring. The flowers open at sunrise, and stay open until dusk. Both the cactus and its blooms are highly UV-reflective, so the blooms attract very enthusiastic bees, wasps, ants, and other pollinators. Like all cactus, horsecripplers are not self-fertile, so they require at least one other blooming horsecrippler in the vicinity in order to set fruit. Now, back to that fruit. Another common name for this cactus throughout its range is “candy cactus,” because its fruit was gathered by early settlers, juiced, and boiled down to make candy and syrup. Those who have never had prickly pear or dragonfruit will be disappointed with the first taste of fresh horsecrippler fruit, as it has an extremely delicate and subtle flavor. The remnants of the bloom are also extremely spiky, so it takes some finesse to remove the fruit when ripe. In the wild, the fruit grow to about the size of a gumball, but captive plants can produce ones the size of a ping-pong ball without hesitation. Seeing as how the black seeds are both large and numerous, the best way to enjoy the fruit is to swallow the pulp, seeds and all. (Trying to remove the seeds without a juicer is folly, and they really don’t hurt you.) This seems to work very well for the coyotes, pigs, and skunks that readily devour the fruit, and these animals spread seeds in their feces to new locations. In captive culture, the only disappointment with E. texensis is its extremely slow growth rate. Based on observations on horsecripplers growing on gravel berms and other manmade areas, most seem to need at least 30 to 40 years before they reach a moderate size, and large specimens may be well over 100 to 200 years old. Considering that they can survive ground soil temperatures well in excess of 160 degrees F (71 C), slow growth is a fair trade. Their only real threat comes from the occasional deep freezes that hit Texas, such as the bad freeze we had last February. Horsecripplers can handle subfreezing temperatures for a few days, but any situation where they would be exposed to temperatures below 20 degrees F (-7 C) for more than a day requires that they be brought indoors for shelter. As for captive growing requirements, horsecripplers aren’t particular about soil mix (standard potting mixes work well, and perlite or Growstones in the bottom is highly recommended), but they HAVE to have suitable drainage. Terracotta pots or plastic pots work well, so long as these don’t have bottom trays that allow the pot to collect water. In the wild, the clay is so thick and tough that horsecripplers usually only put out a small taproot about the size of a carrot. In captivity, they rapidly put out a thick and extensive root clump, which sometimes adhere to the inside of terracotta pots. Seeing as how they really need to be repotted only once every few years, though, that’s a minor issue. Fertilizing is, likewise, quite easy, and I use bat guano once per month, one cup per twenty gallons (70.7 liters) of water, during the growing season. A lot of this knowledge was learned with literal bloodshed, as a whole line of horsecripplers from the ranch are now Kareds. While my father-in-law is very protective of the critters on the ranch both fauna and flora, he acknowledged that ones growing near the residential area on the ranch were potentially dangerous to children and pets. Rather than simply stripping them out, I volunteered to move and propagate them, and they’ve turned out to be surprisingly easy and friendly to keep in captivity. In fact, the only reason why they don’t show up more often in propagation is due to their incredibly slow growth. Just wear gloves when repotting, and they may outlive you. Unbeknownst to us, the ranch had one last surprise in my cactus rescue. At the edge of a gully was a particularly odd fellow, looking as if it was diseased or tumorous. It was literally at the edge of the gully, where one good winter or spring storm would wash it into the gully and to its death. Getting it home, it became surprisingly comfortable with captive life, rapidly spreading out its roots and blooming this spring. Ryan Kitko helpfully identified the cactus’s condition. 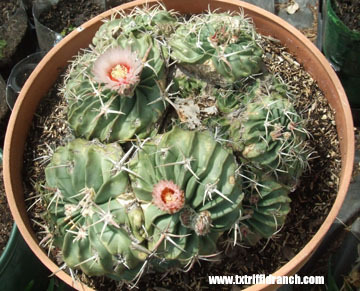 Cristate or crested cactus are relatively common, if nearly impossible to replicate, and this one was a very rare cristate form of E. texensis. Ryan related that the last paper on a cristate form was published in 1936, but I discovered a couple of cactus nurseries that had examples of their own. In any case, this one had been in that little clearing for years, and possibly centuries, as its growth is even slower than other members of its species. Between its age and its appearance, only one name was appropriate: “Davros“. This year, Davros the cactus actually bloomed three times, and all of the fruit ripened. Although most cristate cacti can’t produce viable seed, it may be time to see if this is true with this beast. Okay, so last week’s Black Jungle Terrarium Supply open house is over, but that doesn’t mean that this summer is bereft of other carnivorous plant nursery events. For instance, many readers may be familiar with the carnivorous plant nursery California Carnivores thanks to Peter D’Amato’s exemplary reference book The Savage Garden, but did you know that California Carnivores is hosting its annual pot-luck party pigfest on July 23? A little bit earlier, and further up the Pacific coast, we have the early summer open house at Sarracenia Northwest, just east of Portland, Oregon. This open house is scheduled for July 16 and 17, with a second set on September 10 and 11. The crew at Sarracenia Northwest is always good for a great presentation and exemplary plants, so you might as well plan a vacation over that week and hit both events. Just make sure that your 18-foot truck’s axles can handle the weight of the plants you’ll be bringing home. And in much smaller but equally important events, the Triffid Ranch is getting in on the game as well. I’ll be at the Seagoville Public Library in Seagoville, Texas (just east of Dallas) on June 21 as part of its summer reading program. Considering how badly Texas’s public libraries are being stretched in the current budget cuts, this is purely a pro bono event, and anybody with questions can and should attend. See you then? For those in the Dallas/Fort Worth Metroplex, a quick heads-up. CBS DFW is running a short segment on the Triffid Ranch during its 4:00 newscast today, and it may run later. Either way, when the segment is available online, I’ll let everyone know. EDIT: It’s now online. Why does nobody tell me that I sound like Fran Drescher on helium?